Deanna Nebenionquit is Anishinaabe from Atikameksheng Anishnawbek, formerly known as Whitefish Lake First Nation. 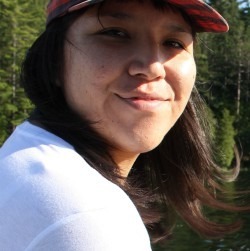 Deanna is a graduate of the Applied Museum Studies program at Algonquin College in Ottawa, Ontario (2012) and a graduate of the RBC Aboriginal Training Program in Museum Practices at the Canadian Museum of History in Gatineau, Quebec (2013). From 2014–2018, Deanna curated art exhibitions and managed the permanent art collection at the Art Gallery of Sudbury | Galerie d’art de Sudbury in Sudbury, Ontario. She has been working at Ontario Library Service – North as the Capacity Building Advisor since July 2018.